6 Level Flashcard System ac. 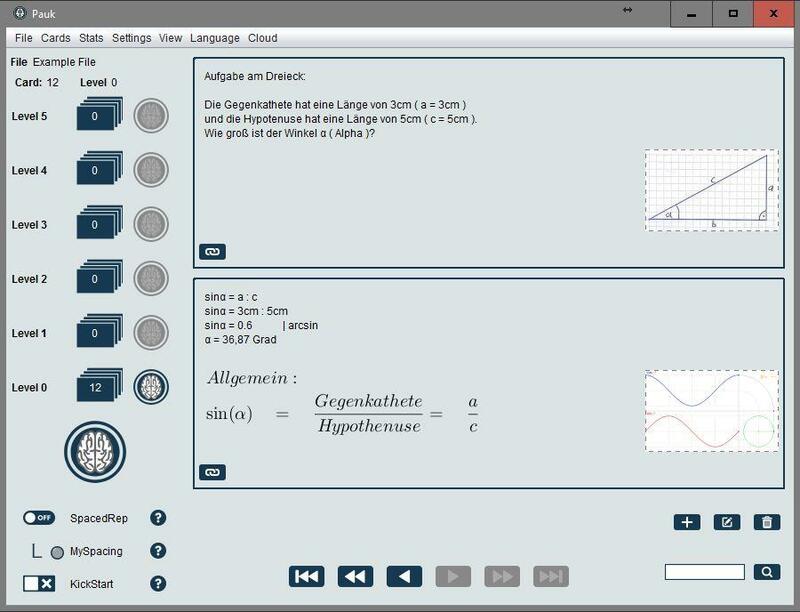 to Sebastian Leitner – Spaced Repetition on/off – super easy creation of new learning cards – supports math formulas via LaTex, math flash cards app – Multiple Choice – Win/Mac/iPhone – Dropbox sync of flashcards – Speech to Text Writer – automated translation – Text to Speech Reader. Speech to Text Writer, automated translation, Text to Speech Reader. Speech to Text Writer: Tired of typing all these questions and answers? Now you can use your microphone to convert your speech to text in real time. Simply speak your questions and answers in the mic and the system types it automatically and without spelling errors. This is an extremely quick way how to create many cards with ease. Automated translation: Do you need to have one language for your question and another one in your answer? You can use the build in google translator to translate vocabulary or whole sentences immediately and without typing. Even more advanced: Combine it with the Speech to Text Writer with the Translator: Use the Speech to Text Writer to automatically type in your question or vocabulary and translate it with one click in the language of your choice. Doesn’t get more simple. Text to Speech Reader: Read cards out loud by the build in Text to Speech Reader. Useful e.g. to check for typing errors. Our ear can spot immediately if the voice reading your text sounds wrong. Also, listening to and at the same time reading your Cards will have a positive learning effect. 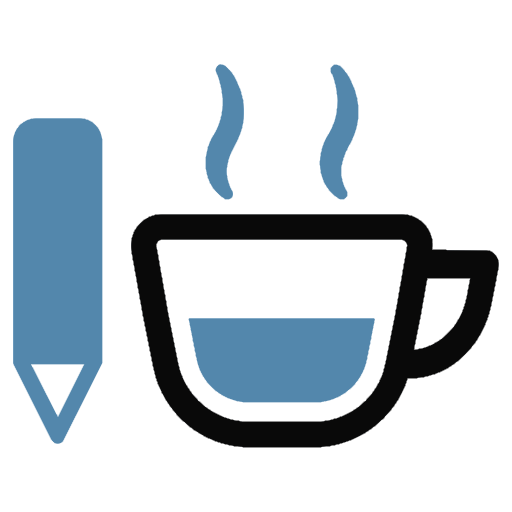 Combine visual, auditory and reading/writing type of learning. KickStart is the name of a specific Learning Algorithm. Use this method if you want to learn a subject for the very first time. KickStart has two functions: 1. It automatically sizes a deck of cards in ideal portions and 2. repeats wrong answers more quickly. It is important to correct wrong answers immediately – as otherwise you risk to memorize it. Memorizing is a function of how much work the brain has to deliver while creating an answer which makes sense to you. This effort is much higher than just reading the right solution from the answer card. So trying to remember an answer while doing a repetition session, may have a lasting impact on the memorization of it, also if the answer was wrong. This is why this wrong memory must be overwritten very quickly. Kickstart reacts faster than Spaced Repetition or the normal Leitner Fashcards Method. Good memorization of your ppt slides and run a common & clear thread through your presentation is key to get your message out. It’s also extremely helpful if you suffer from speech anxiety. If you are 100% sure you will remember your text, speech anxiety will be much less of an issue. To properly prepare a Speeche or Presentation, Microsoft PowerPoint slides can be imported into the Learning System. In doing so, Pauk will automatically distribute the content of the slides on the question- and the answer card. You can learn your speeches offline on your Laptop. No mirror, empty chamber or good friends to practice needed. Of course you have a feeling for how long it takes to get a grip on your subject – but do you know for sure? You will usually only know after the fact. 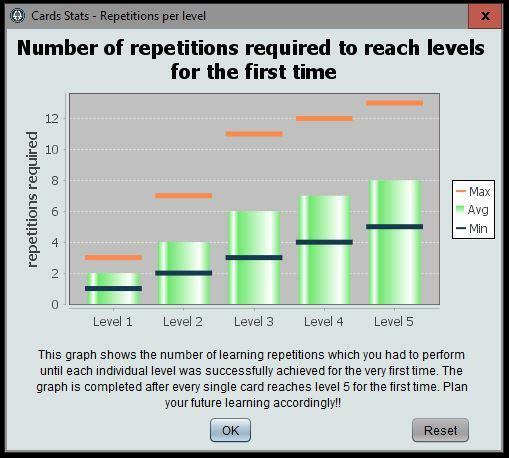 Collecting statistical data after each Flashcard learning session can help you anticipate how many days or how many repetitions you need to learn a similar topic in the future. Of course, this measurement varies from person to person and also depends on the complexity of the subject and how you write your flashcards. 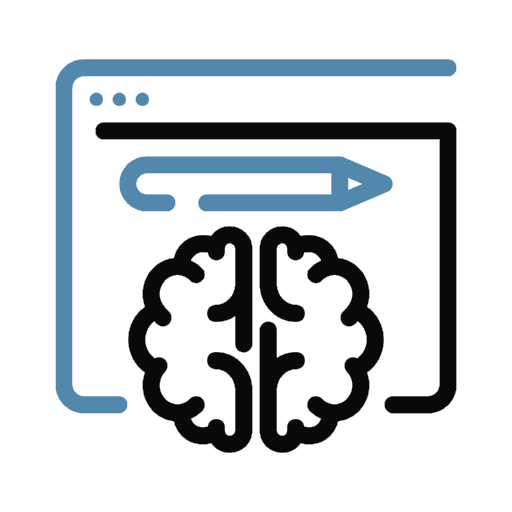 If you use a tool like Pauk to prepare your tests, the tool will output (after a few learnings) your personal lead time to prepare a topic to perfection. These can be the days you need to start in advance or the number of repetitions you need to master a subject. Soon, you will know these figures for all learning situations. This information is useful to determine the time you need to learn the information properly without over preparing. Text to Speech Reader. Reads the text on your cards with natural sounding voices, many languages. Speech to Text Writer. Type your cards via Microphone. Spaced Repetition will space the waiting time between repetitions, increasing the spacing gradually at higher levels. Hence, only cards that are due for repetition come up automatically. The intervals for Spaced Repetition are based on the Fibonacci sequence. Use KickStart if you want to learn a subject for the very first time. Kickstart automatically sizes a deck of cards in ideal portions and repeats incorrect answers more quickly - in order to overwrite false memorization early in the learning process. PowerPoint slides can be imported. A pre-formulated Question and Answer for each slide will be automatically created. The Card Sorter is a graphical User Interface in which you can rearrange the sequence of your cards, delete them or make a copy. No keyboard typing in of cards anymore. Types text automatically which you dictate via your microphone. Translate your Questions and Answers back and forth in many languages - with one click, vocabulary and whole sentences. As a special answer type, the user must type in his answer on his keyboard, which is then automatically compared with the right answer by the system. If a microphone is connected, you can add an audio comment in the question and the answer. Useful to take down a dictate. Add a weblink for further explanation,e.g. Wikilinks, Youtube etc. Display your Math formulas beautifully through LaTex language. Easy import from editor. Store a number in the Hint field. In complex questions, answers require more than one fact to get them right. This number in the question will serve as a reminder of the number of facts that you need to remember. Restart your repetition of older set of cards with resetting the learning status back to initial. Randomly mix cards to avoid beeing dependent in the sequence. Used mainly to learn vocabulary. User must click a button to see the answer. No reading or translation required. Intuitive Icons will tell you the functionality behind the buttons. Adapt the language in the user interface by editing the .properties file in a text editor. The language files are found in the ``Language`` folder. Just edit the file, name the file according to the new language and place it back in the Language folder. At next startup, select the new language from the ``Language`` menu. Do you need your files wherever you go? You can access any of your Pauk files from Dropbox. Share these with your friends or keep them for yourself – it’s up to you. You can also share your files via Email, Google Drive, iCloud, or any other platform. Must be done in the Desktop app. The iPhone screen is way to small to create and edit cards efficiently. Powerful statistics will help you to anticipate how many days or how many repetitions you will need to learn a similar topic in the future. Useful to set up your learning schedule. Exercising your knowledge is vital! You can review your subjects in six levels. Mastering the highest level guarantees that every fact will be permanently imprinted in your long term memory. Spaced repetition is a learning technique which utilizes increasing intervals of time between each subsequent review of the material that you have previously learned. The calculation of the length of each of these review periods in based on a Fibonacci sequence is are automatically adapted to your learning style. Use KickStart if you want to learn a subject for the very first time. Kickstart automatically sizes a deck of cards in ideal portions and repeats incorrect answers more quickly – in order to overwrite false memorization early in the learning process. 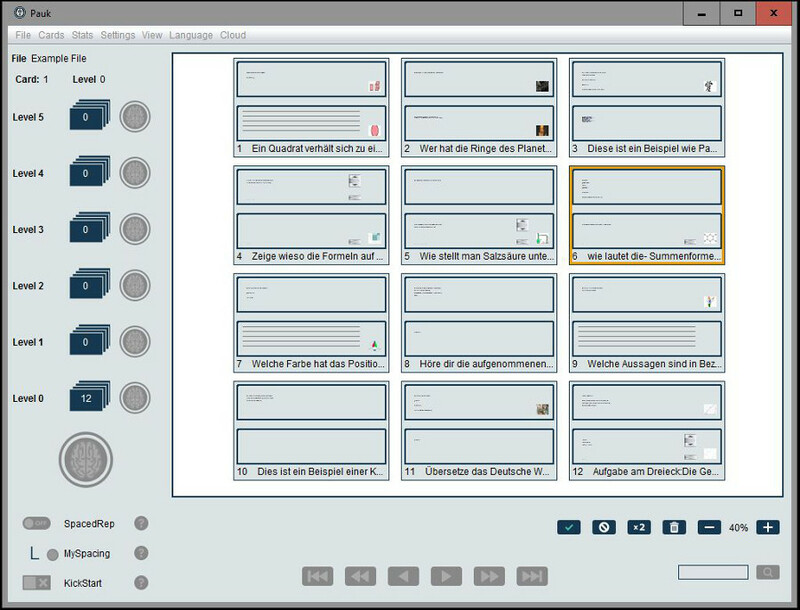 Pauk is based on the well-known 6 Level Flashcard System created by Sebastian Leitner. That’s why you can use Pauk to learn anything that requires factual knowledge, such as vocabulary, history, geography, etc., as well as more complex scientific matter like chemistry or math and physics formulas. Occasionally, you may want to prepare a presentation for school or business. Pauk makes this simple by enabling you to import Microsoft PowerPoint slides into the Learning System. When you do so, Pauk will automatically distribute the content of the slides onto the question and answer cards. 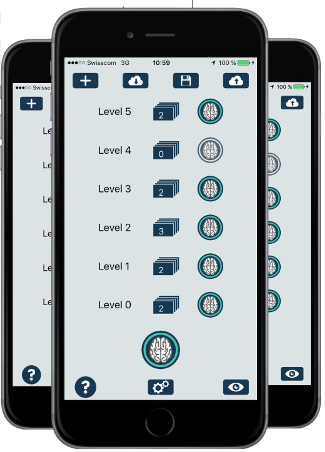 Basic 6 level Flashcard System: Cards will move up from level 0 to level 5, depending on whether or not you answer correctly. This means that correct answers promote movement to cards at the next level up. On the other hand, wrong answers set the card back to level 0. SpacedRep: Spaced Repetition will space the waiting time between repetitions, increasing the spacing gradually at higher levels. Hence, only cards that are due for repetition come up automatically. The default waiting time is based on the Fibonacci sequence. However, depending on your personal situation, these numbers can be automatically adapted with MySpacing. MySpacing: Automatically adapts the SpacedRep spacing to your personal learning style and the complexity of each card. This is useful because of the high variation in individual learning situations, such as the age of the learner, the subject, etc. KickStart: Use this method if you want to learn a subject for the very first time. Kickstart automatically sizes a deck of cards in ideal portions and repeats incorrect answers more quickly. ExamMode: Assuming you’ve already repeated your cards in preparation for the exam, ExamMode only repeats the cards hanging in lower levels (0-3). You save time by not repeating cards you already know (Level 4 and 5). Your practice is much faster because you are only repeating the knowledge gaps, which takes less time. Learn your PowerPoints: Import your PPTs into Pauk, and the import logic will automatically propose the Question and the Answer Cards. With little to no adaptation, you can learn and practice your presentation. Pauk Flashcards include all of the card’s information in the file, which is stored on your hard disk (audio, picture etc.). This means that you are not dependent on a specific website to access the full content. This is also why you can send your flashcard files to anybody in order to edit them or learn from them anywhere. If you’ve already created Flashcards on other systems like Quizlet or Cram or in a text editor, you can convert them to Pauk files here. Thus, you can benefit from a lot of already existing material. However, writing your own is still the best way to prepare for your tests. The advantage of Pauk flashcards app in comparison with other tools is the ease of creating own unique digital flashcards (flashcard maker). Why is creating your own flashcards for study so important – you may ask. Can I not just use any of these decks, which are already out there? Let me answer this for you. Of course, one can learn from pre-made cards created by somebody else, but the learning efficiency is by far not the same compared when you build your own questions. Creating your own questions will force you to think about the topic deeper and building your own storyline why something is important. This process already greatly enhances your general understanding, and in most cases is very satisfying. In addition, these own created study material will only consist of content, you personally do not know. You do not want to spend time having to repeat questions, which you anyway know in and out, only because somebody else did the deck and made the wrong selection. In addition, the content that will be asked in the test will differentiate greatly from school to school and from teacher to teacher. To pass tests successfully, in many cases you will need to be able to parrot individual facts presented in the school / by the specific teacher, if you agree with them or not. The differentiator between an excellent grade and an average grade is often not the basic understanding of a topic (as this is more difficult to test), but how detailed you can repeat what was expressed during the classroom sessions. I am not saying that is the right way to do a selection of students, but it just reflects the reality how this selection is done in practice in many places. The aspect to adjust what you learn to the individual situation is therefore crucial to achieve excellent grades, and that’s why the need to personally create and manipulate flashcards easily and quickly. This is exactly one reason why Pauk is so successful. 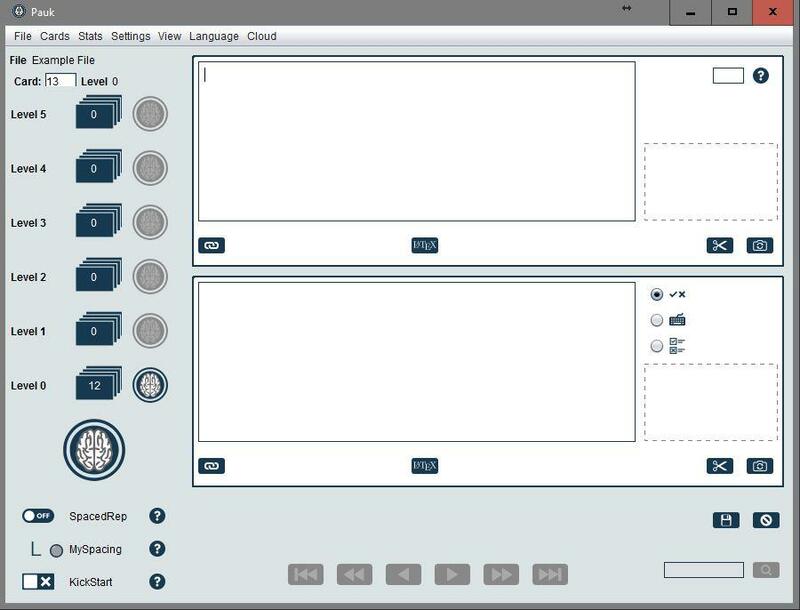 Pauk flashcards application is, apart from the learning functionality, a flashcard maker, a flashcard generator. In the Pauk card editor (flash card template), where you can build your individual study content, you will find all options you ever wished to make the creation of the cards easy and fun. The same functionality to create and edit flashcards from the desktop version, you will also find now in the Pauk Android app. (study apps android). While typing on a Keyboard may be easier on your desktop, the Android version does support useful functionality for easy data entry: Like speech to text, automated translations in many foreign languages, a useful card sorter, or camera and microphone integration to add multimedia content easily from your mobile device, or tablet. 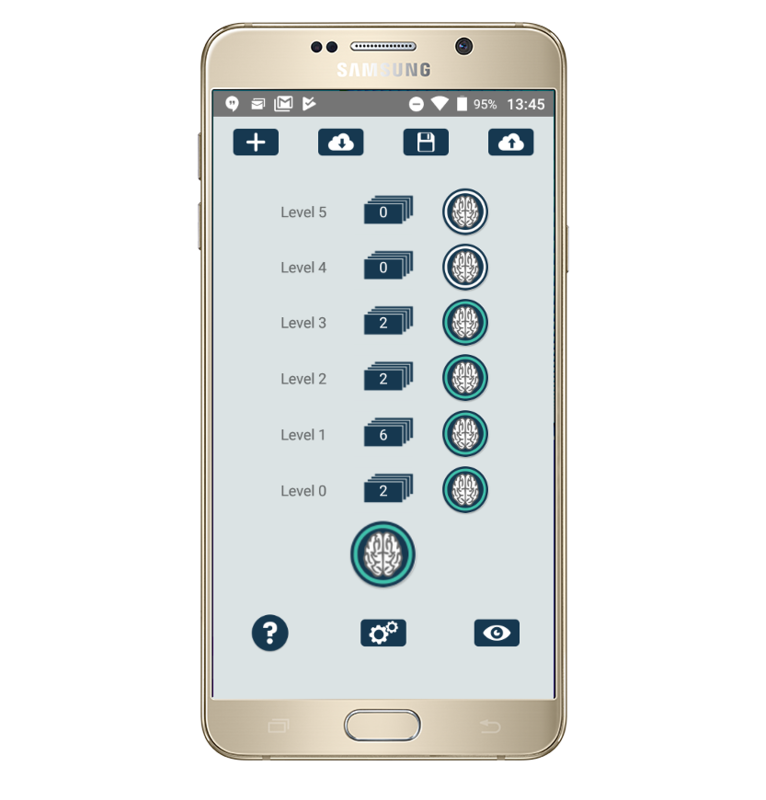 The Android version also supports the advanced learning modes like spaced repetition (spaced repetition flashcards). Finally, as you can google and confirm for yourself easily, flash card learning is the scientifically proven and most efficient way to pass exams. © Copyright 2019 Pauk. All rights reserved.